More and more media brands and content creators are realizing the value of visitor engagement. Understanding authentic website engagement — and being able to improve it — is directly linked to increased website revenue, better ad rates from advertisers, and increased return visitors. The issue that most content creators and digital publishers face with affecting website engagement is their ability to measure and understand what variables are most dramatically affecting a visitor’s behavior on their site. 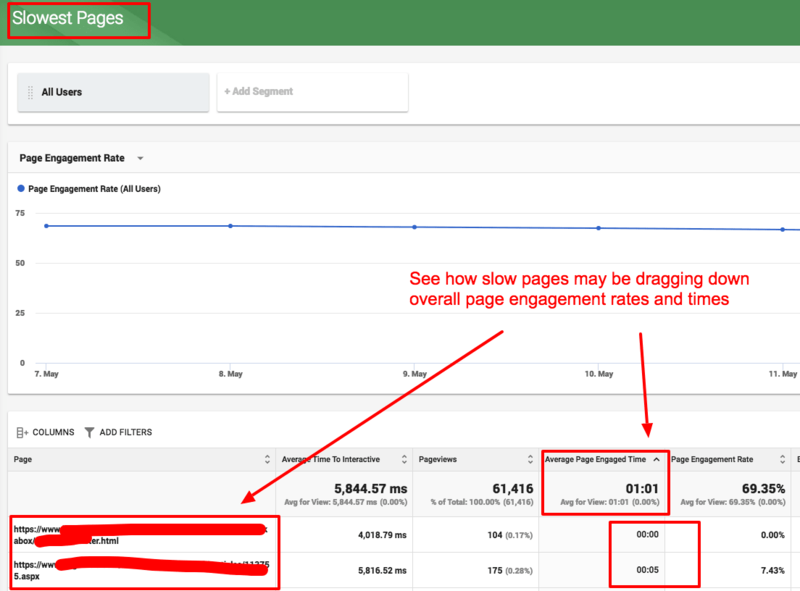 Below, I’ll give examples of some data that anyone can get from their website and how to analyze it to make meaningful changes that will improve objective website engagement metrics (like engaged time on site). What is the value of objective website engagement? Publishers often struggle to separate subjective and objective user experiences. Objectively, using data, we can look at visitor behavior in a way that is quantifiable. 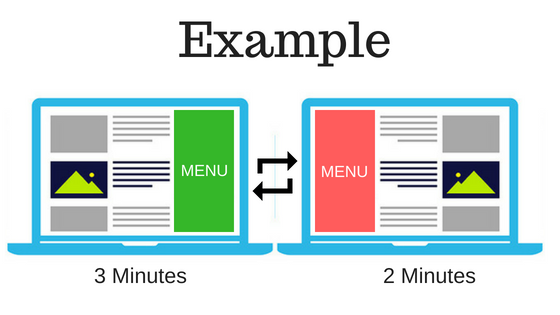 For example, if the average visitor spends 2 minutes on a site when the navigation menu is on the left, and 3 minutes on the site when the navigation menu is on the right, we can determine that the menu on the right is providing a better experience. The problem publishers encounter is when they perceive that a menu on the left looks better. This can create blind spots for publishers that may not always be loking at visitor experience data. Ultimately, these simple metrics and tests are easy. However, as we’ve highlighted before, not all user experience metrics are created equal. Time on site, bounce rate, and pageviews per visit are great metrics but are not always telling publishers the truth about how a visitor is really behaving on the site. Engagement Time: How long a website visitor is engaged with the content during a session. This excludes time they spend waiting for content to load, scrolling quickly, messing with navigation, etc. 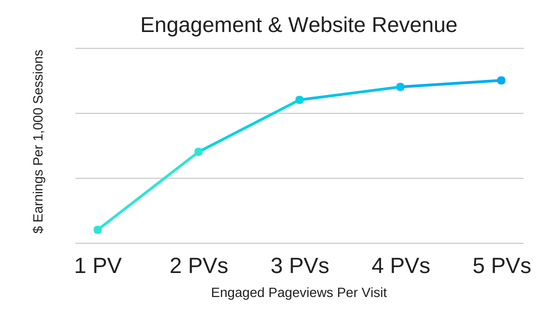 Engaged Pageviews Per Visit: The number of pageviews that include at least 15 seconds of engaged time on page. This highlights how many quality pageviews actually taking place. We’ve talked in-depth before about why advertisers are interested in engaged visitors and why ad auction prices directly relate to website engagement before, but the actual behavior of the visitor plays a role in the on-page earnings as well. What’s the difference? Website engagement refers to how a visitor engages with the content of a page. This has a direct relationship with advertiser metrics like CTR, viewability, campaign performance, and more. The more engaged the visitor, the more beneficial that visitor is to advertisers and the more they are willing to pay to reach them. Advertisers bid these prices in digital auctions based on historical data for that site. Visitor behavior refers to how a visitor acts once they are on the website; meaning, do they bounce, visit multiple pages, spend lots of time on the site, etc. 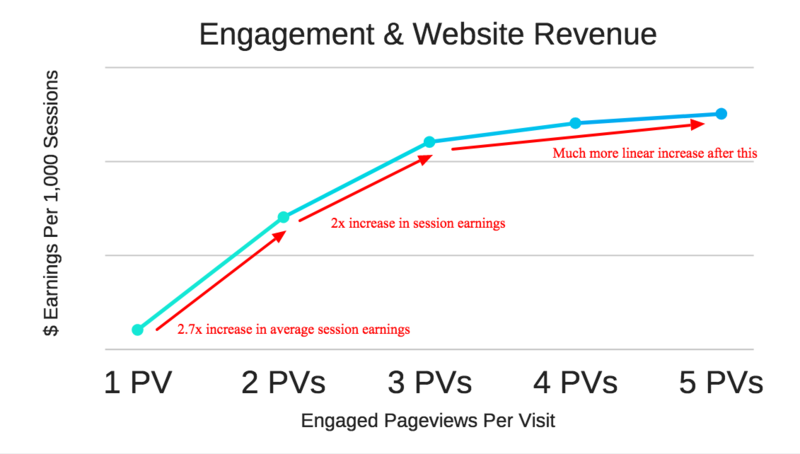 Looking closer at the chart above, we can clearly see that getting visitors to engage beyond that first and second pageview offers major revenue potential (session earnings are nearly 3-6x higher). Looking beyond pageviews, we’ve recently done some studies on engagement time and SEO. We’ve continued to learn that it’s not just the pageviews that matter in the grand scheme of things. Engagement time is not only valuable on its own for ad revenue, but also for organic traffic. Engagement is a factor of relevance for search engines like Google. It tells them that a searcher is satisfied with the content they are getting. That’s talked about a lot here. Ultimately, website engagement is really critical to long-term ad rates, overall revenue, and organic web traffic. It would probably be really beneficial to increase it, right? Let’s dig into how that can be done. One of the best ways to start influencing website engagement is to better understand engagement time on your website as it stands today. There are a couple of core metrics you should understand your audience to improve the engagement rate on both your existing and new content. Use these engagement measurements to better understand your sites content, pages, and structure. Here are some examples of how to do this. 1.) Word count and website engagement. We showed previously how much this can vary from site to site. Word count plays a critical role in how much visitors are engaging in your site. Do longer articles produce more engaged visitors or do they overwhelm them and cause them to leave early? It is different on every website, but this is very important to understand. In this example (chart above), we can see that the 1,000-2,500 word articles are the sweet spot for engagement. The site shown has 213 articles that are 750-1000 words long. They could theoretically double the website engagement of those pages by augmenting the content to lengthen the articles with relevant material. Takeaway: See how word count is affecting page engagement time. Explore how you might be able to alter word count in existing articles to improve this. Then, use this data to shape new articles and content that you produce to optimize for the best engagement time. 2.) How deep are visitors scrolling? Another interesting way to look at website engagement is to understand scrolling behavior. How deep do visitors need to scroll to reach peak engagement time? Imagine if you learned that users that scrolled more than 25% down the page engaged 4x as much on the website? Wouldn’t you want to try to do things that influenced users to scroll further down the page? Knowing about that 25% breaking point for engagement on your website could be really helpful in understanding exactly where you needed to engage users the most to impact total engagement. How do you impact scroll depth? Takeaway: Understanding how scroll percentage affects engagement time on your site can give you a powerful weapon in helping you engage readers. Use some of the tips above to keep visitors scrolling. The key is breaking up the content with digestible pieces of information/media. 3.) Do videos help or hurt website engagement when embedded in content? Do landing pages that contain videos within your content improve website engagement or hurt it? I’ve seen it do both … to websites that were very similar. It really is going to depend on your audience. You may want to embed videos on a number of articles/pages with similar word counts and measure them vs. an equal number of pages without an embedded video with the same word counts. See which ones perform better, and compare the articles with videos to the previous time periods (when they didn’t have videos embedded). You should be able to get a pretty clear picture of which ones your visitors prefer. In Big Data Analytics you can do this by sorting landing pages by engagement time (CONTENT > LANDING PAGE > Segment by Engagement Time). Just grab some similar landing pages and look at them with and without video. 4.) 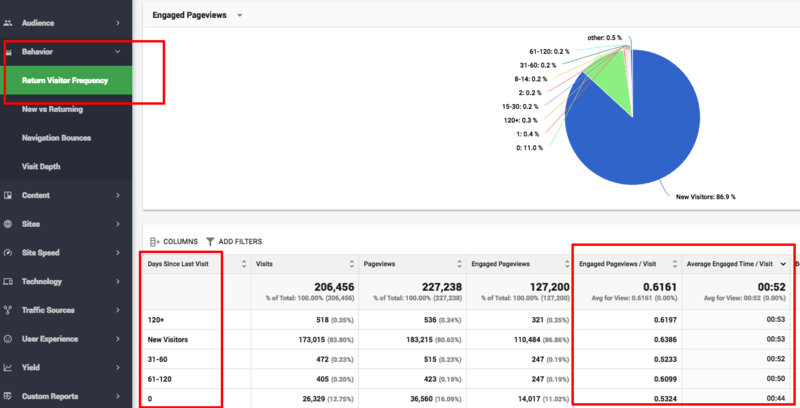 Who’s more engaged — new visitors or return visitors? This data is a little less directly actionable than some of the others but it is fascinating information to dig into. It can be a lot of fun to see what types of users are actually the most engaged in your content. Is it the new visitors, the loyal visitors, the not-so-frequent-visitors, or someone else? Big Data Analytics Report: Go to BEHAVIOR > RETURN VISITOR FREQUENCY > Sort the column of info in the table by engagement time and engagement rate to get insights on both. The actions you could take based on this information will really vary depending on the content your site displays. For example: You may manage a technology news website and learn that your new visitors are actually more engaged (more engagement time, more engaged pageviews per visit) than your loyal visitors. This may mean that you need to look closer at the types of content that you create. Is it more tailored towards first-time visitors? Is this the site’s intention? Takeaway: Find out more about your audience. Understand what types of visitors are most engaged in your content. Use this information to ask yourself questions about whether or not this makes sense and if there are positive changes that could be made with this knowledge. Ever wonder if people copying and pasting things from your site was indicative of a good experience on your site? Do you think that matters? Look into it. Are the people that share your content on social media the ones that are most engaged? If so, how can you encourage more shares — or visa versa — how do you engage users more to increase shares? Maybe that’s something you can learn by looking at your pages with the most shares per visit. What can you steal from those pages to improve sharing on other pages? Or, what about looking at Visit Depth? Would it be helpful for your site to know how many pages your most engaged visitors read? Do the most engaged visitors on your site only visit 1 or 2 pages? Or, do they visit 5-6 pages on average? Use data from your visitors to help you draw insights into how they engage with your site and it’s content. Leverage objective engagement data to augment existing content to increase revenue, improve SEO, and make your visitors happy. Do this by learning from top performing pages. Use this data to guide new content creation (an example could be: all articles should exceed 750 words). This information is invaluable to publishers who understand that their relationship with visitors is paramount to their continued success. And frankly, this is the easiest, most accurate, and scalable way to measure and understand that relationship. Thoughts, ideas? Leave them below. Most threads build up lots of good questions and answers, so check the comments for additional info. 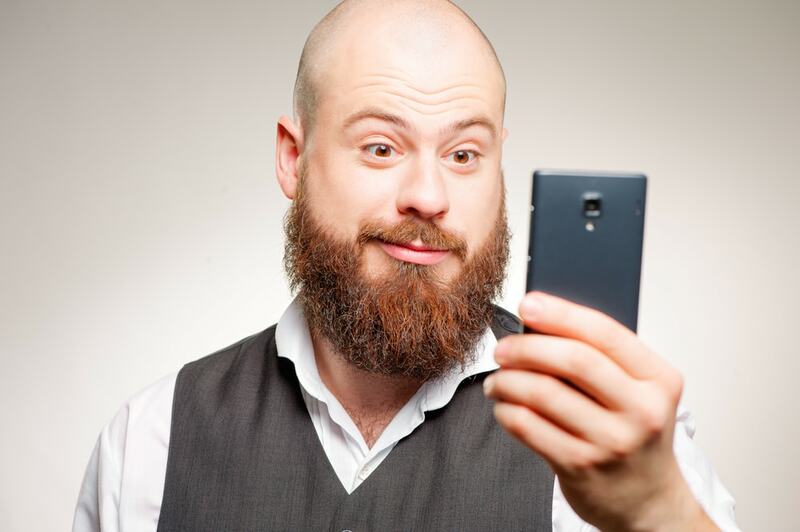 Is it the Ezoic ads that will improve user engagement? Hey Kelvin, I’m not sure I understand the question. Ezoic will allow publishers to automatically test ad placements; which does improve engagement time. However, the ads themselves are not really a variable you can measure engagement time around; as every visitor will get different ads based on targeting. 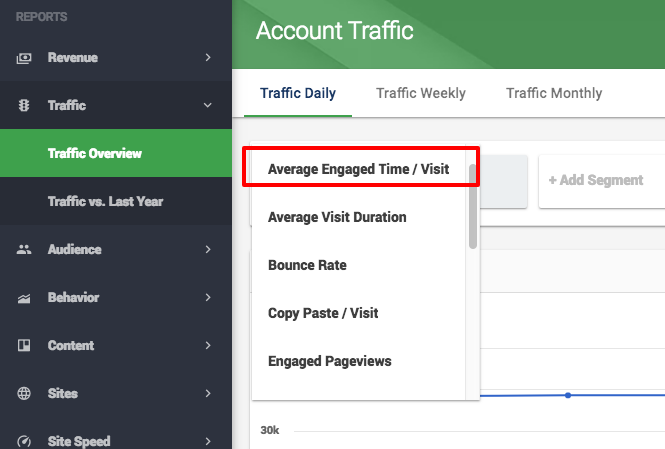 I use Google analytics on my site, can I get access to engaged visitors there? Or do I need to install the Ezoic script on my site? There are few ways to full fill the requirement of the user and make them happy, this is possible in such way that it will go on working and it will help and take support by an algorithm to get the best work for the betterment of the website. This is actually a great topic, and the analytics will definitely help us understand the behaviors of the consumers that will eventually impact the business we are running. Nice post! And thanks for adding images. They are really helpful. I think am confused. Does Ezoic ads Improve user experience? 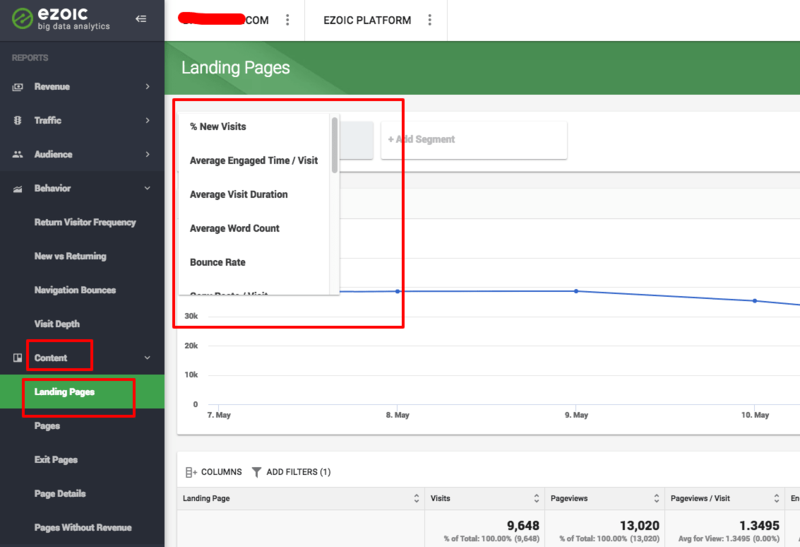 Ezoic uses machine learning to automatically balance UX and revenue based on how visitors respond to different ad combinations over time.